Book a screening of Ping Pong! The U.S. Ping Pong Tour is bringing the sport of table tennis to older adults across the country,and inspiring everyone to get up and play! 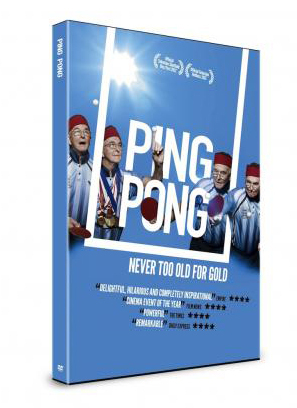 Screening in theaters, retirement communities, care homes and schools, Ping Pong will show audiences the importance of competition and sports at any age. We have different prices for non-profits, business and universities. 1. Get a Ping Pong DVD: We’ve made it easy for you to host a screening. If you’re ready to book your event right now, just visit the U.S. Ping Pong store, and purchase your screening DVD. Still have questions? Fill out this form and a member of our team will get back to you ASAP. INQUIRE ABOUT HOSTING A SCREENING OR NEED HELP? 2. Find a suitable venue and set a date: From care homes to churches to the local community center, Ping Pong can play anywhere there is a DVD player and a screen. Make sure to send us your date so we can put it on the website! 3. Let people know it’s happening: We have created an online poster that you can adapt with information for your screening. Head to the poster maker, fill in your details and print off your personalized film poster. DVD: Including screening rights so you can show the film to any audience in any location. Instructional Video: A 10 min DVD extra that takes you through all the basics. Your Ping Pong Play Pack will include includes an unlimited public performance license, based in your organization. This means you can show the film as many times as you'd like in one location. If you would like to purchases a license for multiple locations, please contact us. All screening hosts are legally obligated to purchase the exhibition license to show the film.